Connect with the Economic Alliance on Facebook! 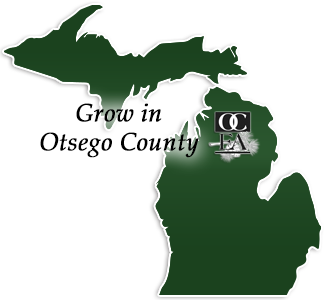 The Otsego County Economic Alliance, Inc. (OCEA) is the economic development partnership serving Gaylord and Otsego County. The mission of Otsego County Economic Alliance, Inc. is to champion economic growth while enhancing the quality of life in Otsego County through public/private partnerships. OCEA is a collaborative, community supported, full-service economic development organization; serving as the recognized champion of economic change and growth in Gaylord and Otsego County. OCEA provides leadership, vision, education and promotion of economic development; and provides the services and assistance necessary to develop high wage, high skill, base industries in Gaylord and Otsego County, through retention, expansion and attraction as well as entrepreneurial encouragement. OCEA recognizes that its primary role in managing economic development is to impact the number and quality of jobs by retaining, expanding and attracting industry to the county. In doing so, the nonprofit has agreed that it can only be effective in this role, if all aspects of the community - its leadership, infrastructure, land use, public services, and overall quality of life - are conducive to this goal. Employers within Otsego County have a large group of skilled and educated workers to draw from with 76% of the workers being over the age of 18. Otsego County has a unique secondary and technical education program through the partnership of University Center at Gaylord and the Kirtland M-TEC Center. This 47,000 square foot state-of-the-art facility offers a range of higher education services and training to residents in northern Michigan. With the retail industry ever growing within Otsego County, there were 3,181 people employed in sales and office occupations. Educational, health and social services provided employment to over 22% of the population; while manufacturing and the arts, entertainment, recreation, accommodation and food service industries provided employment to over 26.5% of the population.